Friends of Hackley Public Library is a nonprofit organization established in 1973 to support Hackley Public Library, stimulate interest in reading and literacy, help promote the Library's services, and enhance the cultural life of the Muskegon, Michigan, area community. We are an active group of community volunteers with a strong 40-plus year history of successful fund raising for library projects and programs. Friends are good stewards of our 126-year-old historic building. 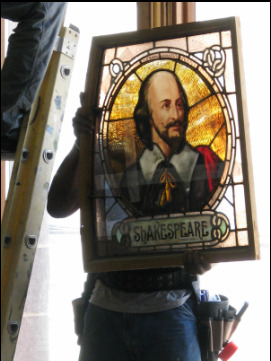 $120,000 to restore the Library's stained glass windows. $104,000 for renovations in the Youth Services Department. Friends most recent campaign was to raise funds to "reinvent" the Library's lower level into a community gathering space for library programs and for use by community groups. Come check it out! ​We provide $20,000 each year to support hundreds of free programs for children and adults, including programs that focus on early literacy, history, and music, as well as technology classes and author visits. Friends also supports cultural enrichment in Muskegon through the annual Charles H. Hackley Distinguished Lecture in the Humanities.